Canon EF-M 15-45mm f/3.5-6.3 IS STM at 32mm (51mm eq. ), f/7.1, 0.1s, ISO 100. This image has been modified. Click for full-size image. In the four and a half years since Canon launched the original Canon EOS M, signaling its entry into the mirrorless ILC market, the options available to photographers looking for a mirrorless camera have increased considerably. Canon's follow-up models, such as the M3 and M10, while certainly not bad cameras by any means, do come up short in some important areas. The lack of a built-in electronic viewfinder and sluggish overall performance, for example, place them at a notable disadvantage compared to competing offerings. Canon's latest mirrorless camera, the Canon M5, not only includes a built-in EVF and faster performance, but it adopts an SLR-style camera body and new sensor. Without eschewing the excellent usability and user interface of the M3 and M10 cameras, the M5 presents itself as a camera very much ready to compete against the pillars of the modern mirrorless market, especially with cameras aimed at more advanced photographers. On paper, the M5 is (mostly) the mirrorless camera Canon shooters have been waiting for. But can it reach its potential and help Canon finally plant themselves firmly in the saturated market? Let's find out. Canon EF-M 55-200mm f/4.5-6.3 IS STM at 200mm (320mm eq. ), f/6.3, 1/320s, ISO 125. This image has been cropped. Click for full-size image. Since I Field Tested both the Canon M3 and M10, I was excited to get my hands on the M5. I enjoyed using the M3 and M10 despite their shortcomings. They were very comfortable, easy-to-use cameras, particularly the M10, but they didn't offer enough physical controls to feel like enthusiast cameras. Granted, the M10 at least wasn't trying to be, but the M3 felt like a camera unsure of what it was meant to be. On the other hand, the M5 is very clear about what it is: a Canon mirrorless camera for enthusiast photographers. In addition to its small, but comfortable SLR-style grip, the camera has ample physical controls. In stark contrast to the M3, the M5 looks somewhat like a shrunken-down Canon DSLR. 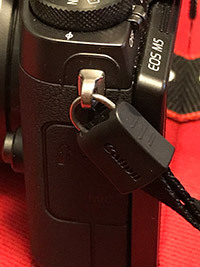 Surrounding the shutter release is a front dial that controls the primary shooting settings (aperture and shutter speed in their respective priority modes, or shutter speed in manual mode). The dial has very distinct clicking sensation, which I liked a lot. It also has a good bit of distance between each click, meaning that it is easy to make precise, one-step adjustments. The second control dial is on the top deck of the camera, toward the rear edge, and feels slightly different but has similar usability, allowing for precise adjustments. What makes this top dial particularly interesting is that it has a "Dial Function" button in the middle that allows you to cycle through a few settings depending on the shooting mode. By default, in priority modes, the dial controls ISO but you can also set it to control white balance by pressing the dial function button. The top deck of the camera also includes an exposure compensation dial. Compared to the M3, two primary aspects of the M5's body stand out: its electronic viewfinder and larger display. Regarding the electronic viewfinder, the first built-in EVF on an EOS M-series camera, it's a 0.39-inch OLED EVF with 2.36M dots. Previously, users have been able to get an EVF experience by purchasing a separate accessory, but it is much better to have it built into the camera itself. I'm happy to report that the EVF works well too, offering 100% coverage, an eye sensor and good performance. The rear display is now 3.2 inches versus 3.0 inches and has 1,620,000 dots, which is up from 1,040,000 dots for the M3. The tilting touchscreen display works well. Its articulation mechanism feels durable and also moves smoothly, not requiring excessive force to precisely position it. The screen can tilt enough to be a selfie screen as well, so there's that. A cost of its built-in EVF and enthusiast-oriented controls and design is that the M5 is larger and heavier than the other M-series models, measuring at 4.6 x 3.5 x 2.4 inches (116 x 89 x 61 millimeters) with a weight of 15.1 ounces (428 grams). This is larger and heavier than the M3, although the M5 is still not a big camera, especially not compared to APS-C DSLRs. On top of the built-in EVF is a hot shoe, but the M5 does have a built-in flash as well. The built-in flash has a Guide Number at ISO 100 of only 16.4 feet (5 meters). The camera's max flash sync, either with the built-in flash or if you wanted to attach a flash to the hot shoe, is 1/200s, which is decent but not great. While not a feature that would show up on any marketing materials, the M5 did include a pleasant surprise when I unpacked it and set it up. Installing camera straps is often annoying, but the M5 has a clever mechanism. 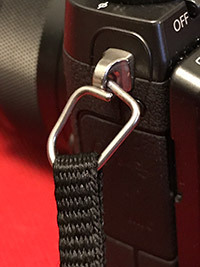 There is a metal ring that is covered by a plastic piece, but you can squeeze the plastic piece and slide it up the strap, exposing the metal pieces on either end of the strap. You then spin the metal piece, exposing an opening, slide it around the strap lugs on the camera, rotate the metal piece back around and slide the plastic cover down. 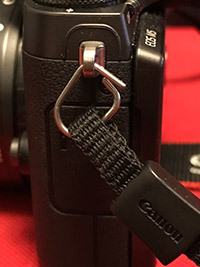 Voila, the strap is attached to the camera. No funneling the strap through loops, no struggling to not twist the strap during installation. It is not a camera-selling feature, but it is nonetheless something I hope to see on all future cameras. 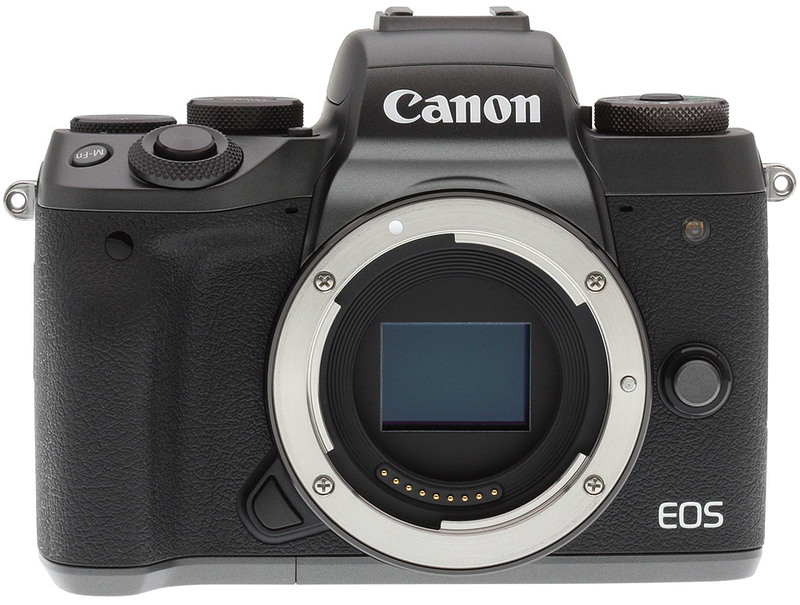 Overall, the Canon EOS M5 has the best camera body of any Canon M camera I've used, which is all of the North American models except for the very first M. Unlike the M3 and M10, which were arguably aimed squarely at entry-level users more than enthusiasts, the M5 feels like a camera designed to work well in a variety of situations, including demanding, fast-paced ones. The dials and buttons all feel good, and while the M5 doesn't have the build quality or ease-of-use as some of Canon's higher-end DSLR cameras, the M5 comes closer than any mirrorless camera that Canon has made so far. 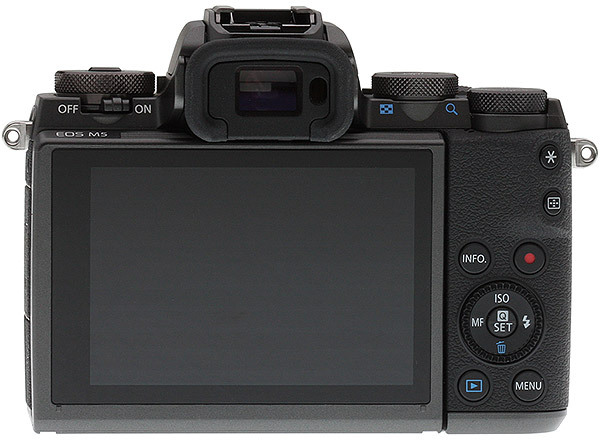 User experience has always been a strong point for the Canon M series of cameras. Thanks to excellent touchscreen functionality and an intuitive user interface, the cameras have been good to use in many shooting situations. With that said, the lack of physical controls and dials, particularly on the M10, meant that the camera wasn't always quick. The M5 blends the best of both worlds, combining the physical controls mentioned earlier with the same great touch-based user interface found on its predecessors. The M5's larger 3.2-inch display helps too, especially when using the Quick Menu. The Quick Menu is accessed by pressing the central button on the multi-selector on the rear of the camera. The Quick Menu can be used via touch or buttons and offers the following settings: Autofocus area, AF operation, image quality, video recording quality, drive mode, self-timer, white balance, Picture Style, metering mode, Auto Lighting Optimizer and image aspect ratio. The ordering of these menu items can be customized, and you can also remove settings if you want. Canon EF-M 15-45mm f/3.5-6.3 IS STM at 45mm (72mm eq. ), f/8.0, 0.125s, ISO 100. The Canon EOS M5 includes a new 24.2-megapixel APS-C CMOS sensor with a fixed anti-aliasing filter and Dual Pixel CMOS AF technology, making it the first EOS M-series model to include Canon's high-performance on-sensor phase-detect AF system. There are phase detection pixels across 80% of the image sensor area. I will discuss autofocus further down below, but this is a big step up for the Canon M line. Likely the same or at least a very similar sensor as the one found in the Canon 80D, it should come as no surprise that the M5 offers good imaging performance. The camera produces photos with good, accurate colors that offer solid true-to-life representations. With that said, there is something to be desired with the M5's image processing. JPEG images, even at low ISOs, display aggressive in-camera noise reduction that rob images of fine detail. It isn't particularly successful with noise reduction either, as the camera produces noisy images at higher ISOs -- more on that in the next section. 100% crop from a JPEG image, straight from the camera. Canon EF-M 15-45mm f/3.5-6.3 IS STM at 45mm (72mm eq.) , f/11, 0.4s, ISO 100. Dynamic range has often been an area of relative weakness for Canon's cameras, particularly when considering their APS-C models. The 80D did a lot to resolve that issue, and the M5 continues the positive trend. Dynamic range can't compete with the Sony sensors found in the A6300 and A6500 mirrorless cameras, for instance, but the M5 still offers a good amount of latitude when adjusting exposure, highlights and shadows. Canon EF-M 15-45mm f/3.5-6.3 IS STM at 15mm (24mm eq. ), f/8.0, 3.2s, ISO 100. At high ISOs, JPEG images can look quite soft. The in-camera noise reduction is aggressive, rendering images with fine details almost blurry. With that said, surprisingly, images can contain a lot of noise despite the strong noise reduction. Fine details will be washed out while there is still a considerable amount of visible noise in the images. At ISO 1600, images start to lose noticeable fine details when viewed at 100%, and there is a decent amount of visible noise in the files. With that said, for non-critical uses or for viewing images at smaller sizes, I would feel comfortable using JPEG files up through ISO 6400. Beyond ISO 6400, the images are very noisy and soft; too much so for my liking. 100% center crops from highest-quality JPEG images with default settings. Unlike with JPEG images, the RAW files impressed me. I think that the M5's biggest issue at high ISOs is the JPEG processing rather than camera's sensor because RAW files even up to ISO 3200 have good fine details and easily-controlled visible noise. 100% center crops from RAW images processed with Adobe Camera RAW default settings, lens corrections enabled. The EOS M5 offers good image quality across a wide range of ISO sensitivities. However, JPEG image processing is an issue, particularly with noise reduction and sharpening. Nonetheless, the Canon M5 renders colors well, captures detailed images and offers a good amount of dynamic range for easily adjusting shadows and highlights with RAW files. The M5 has a variety of interesting shoot modes for photographers who like to get creative out in the field. While the camera lacks a built-in panorama mode, it does offer various scene modes and creative filters in addition to in-camera HDR capture. Canon EF-M 15-45mm f/3.5-6.3 IS STM at 15mm (24mm eq. ), f/4.5, 1/80s, ISO 100. Auto. Click for full-size image. Canon EF-M 15-45mm f/3.5-6.3 IS STM at 15mm (24mm eq. ), f/8.0, 1/60s, ISO 320. HDR (Natural). Click for full-size image. An aspect of the M5 that I didn't like is its auto ISO setting. Auto ISO doesn't offer much control; it only allows the user to select a maximum ISO, but there is no control over shutter speed behavior. Beyond that, the camera offers a lot of nice shooting features and is enjoyable to use. Metering performance from the M5 is reliable and consistent in most situations. The camera offers evaluative, partial, center-weighted evaluative and spot metering modes. The metering sensor's effective range is -1 to 20 EV, and the camera offers up to +/- 3 EV of exposure compensation. It is worth noting that the M5's spot metering option is not tied to the autofocus point, but is rather locked to the center of the image area. A weakness of the M5's metering system is its working range. Shortly after sunset, the camera struggled with exposure metering, underexposing a relatively straightforward scene by roughly a full stop. Similarly, white balance metering tended toward the cool side in low light. It is not a big deal, but it must be considered when shooting in dim conditions, such as at dawn or dusk. The M5's Dual Pixel CMOS AF system works well in most situations, although it not without its weaknesses. The hybrid autofocus system utilizes 49 AF points, which are located on a 7 x 7 grid across the image area. The autofocus points cover a large portion of the image area, with phase detect autofocus points covering 80% of its width and 80% of its height, making it easy to move a focus point to almost anywhere you need. Autofocus modes include single point, AF Zone and Face + Tracking AF. Utilizing the large 3.2-inch touchscreen to move the autofocus point around the image area works very well. You can also use the touchscreen as an AF touch pad when using the electronic viewfinder, but you must enable this feature in the camera's settings under "Touch & drag AF settings." Within this sub-menu, you can also adjust the active touch area. Suppose that you only wanted the bottom right corner of the display to act as a touchpad for the entire image area, you can do that. I found that the default setting of "whole panel" worked best for me, but I can also see the appeal of a smaller area of the display being the touchpad. Canon EF-M 55-200mm f/4.5-6.3 IS STM at 200mm (320mm eq. ), f/6.3, 1/160s, ISO 100. Low light autofocus is an area of weakness for the M5. It is rated to work from -1 EV to 18 EV, which is okay, but not great. However, many of the EF-M lenses are moderately slow with narrower apertures, which hurts low-light autofocus performance. I regularly struggled to capture in-focus shots in moderately low light. Compared to other similarly-priced mirrorless cameras I've tested, the M5 felt slower in dim conditions. With that said, manual focus has been improved with the M5 as Canon has added a focus peaking option, which works well. Like the AF touchpad option, you must enable focus peaking as it is not on by default. You can choose between "low" and "high" peaking level and three colors: red, yellow and blue. Canon EF-M 55-200mm f/4.5-6.3 IS STM at 70mm (112mm eq. ), f/8.0, 1/13s, ISO 100. Continuous autofocus is impressive with the M5. Its subject tracking mode not only works quickly and accurately, but it also proved to be quite adept at picking up a subject when it reenters the frame. It is evident especially when using Servo AF that the Dual Pixel CMOS AF system is a big improvement for the Canon M series and one of the M5's best new features. Overall, the autofocus focus system works very well in good light, providing fast, accurate autofocus performance. However, dim light poses more of a challenge to the M5 than I expected. Performance is an area where the Canon M5 excels relative to its predecessors. Thanks to its new, faster DIGIC 7 processor, the M5 can shoot much faster than the M3. Canon EF-M 55-200mm f/4.5-6.3 IS STM at 200mm (320mm eq. ), f/6.3, 1/500s, ISO 1600. 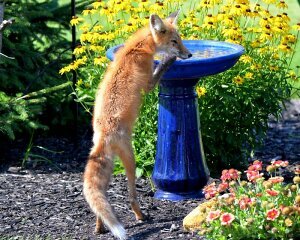 I tested the camera with a SanDisk Extreme Pro SDHC card with up to 95MB/s read and 90MB/s write speeds. I found the camera able to meet Canon's spec of shooting at up to 9 frames per second with autofocus set to One-Shot AF. RAW+JPEG had a 17-frame buffer that cleared in around 8 seconds. JPEG-only allowed for 29 frames -- which bests Canon's spec of 26 frames -- at 9fps and the buffer cleared in roughly 3 seconds. With Servo AF, I could capture 26 RAW+JPEG frames at 7 frames per second with the buffer clearing in 9 seconds. Our official lab results are similar, ranging between 9.2 and 9.4fps with 27 JPEGs, 18 RAW and 17 RAW+JPEG frames. Suffice it to say that the M5 is a much faster camera than the M3, which could only shoot at up to 4.2fps with a 4 frame RAW buffer, but the 17-18 frame RAW buffer depth seems a bit shallow when shooting at 9fps. Continuing Canon's trend of not including 4K video recording on their non-flagship cameras, the Canon EOS M5's video resolution tops out at 1920 x 1080 (Full HD). Framerate is capped at 60 frames per second, so there are no slow-motion or high-speed video shooting options to be found in this mirrorless camera, putting it at a distinct disadvantage in the video department when compared to Sony and Panasonic's offerings, for example. It is not just video specifications that come up short with the M5, but also the video features. The camera doesn't offer zebra exposure warnings, shutter or aperture priority recording modes or a headphone jack. The M5 does include a mic input and HDMI out, at least, but, still, this is not a videographer's workhorse camera. 1920 x 1080, 30fps, Auto settings. With that said, an area where the M5 excels in video is the overall user experience. Not only is the touchscreen very well-implemented, but the Dual Pixel AF system works very well. It's disappointing that you can't view a histogram on the display when recording, but automatic exposure does work well in most situations. While incapable of capturing 4K video, the M5's Full HD video does look quite nice, especially at lower ISOs. The camera records a good amount of detail in the 1920 x 1080 resolution frame. Autofocus is a highlight here, as the M5's video autofocus is fast, accurate and tracks subjects well. Don't sleep on the camera's built-in image stabilization, either, especially if you like to record handheld video. The M5 has a new "Combination IS" mode, which combines a lens' optical stabilization with the camera's 5-axis digital image stabilization. As was the case with still images, high ISO video is not a strength for the M5. When recording video, the ISO range is 100 to 6400 but quality falls off quite quickly, in my opinion, beyond ISO 1600. 1920 x 1080, 30fps, ISO 6400. Overall, for users who don't need 4K video, the Canon M5 is a capable video camera. However, its feature set is limited. The camera makes recording good Full HD video very simple with a reliable autofocus and metering system, so if that's all you require for multimedia, the M5 is solid; 4K shooters should look elsewhere, though. The Canon M5 has built-in Wi-Fi, Bluetooth and NFC. Connecting the M5 to my iPhone was a straightforward process and once connected, the connection was reliable and the live view on my phone looked pretty good. Screenshots from the Canon Camera Connect iOS application. Using the Canon Camera Connect application, you can view and transfer images, link location data and remotely capture images. The remote capture is good overall, although it does have a few weaknesses. You don't have access to many camera settings from within the app, including exposure modes, nor are changes made on the camera itself reflected in the app. I do enjoy that you can autofocus the camera without capturing an image in the app as this can be useful. Canon EF-M 55-200mm f/4.5-6.3 IS STM at 200mm (320mm eq. ), f/6.3, 1/100s, ISO 100. The M5 is an interesting camera for multiple reasons. It is quite clearly the best M camera to date. It is evidence that Canon is finally giving the M series serious shooting features, such as Dual Pixel CMOS AF, and not let the series sit beneath its DSLR lineup. However, if Canon wants the M series to truly match its mirrorless competition and become a viable option for all enthusiasts, it needs to expand the EF-M lens lineup and beef up video features. Nonetheless, the M5 is a genuine step-up in and for many photographers, it's exactly what they've been looking for from a Canon mirrorless camera. Canon EF-M 15-45mm f/3.5-6.3 IS STM at 16mm (26mm eq. ), f/8.0, 0.4s, ISO 100.